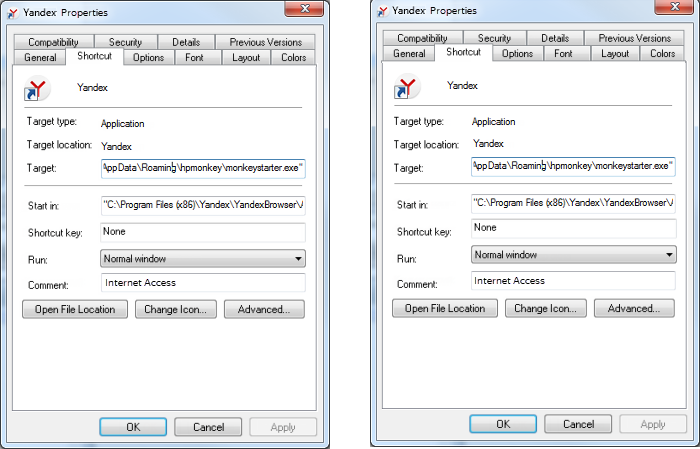 Yandex Browser automatically collects data about unwanted software on your OS. If anything suspicious is discovered, the browser suggests deleting it. Gathering statistics helps your browser detect if you have unwanted software in your system. These statistics do not infringe on your data privacy. Attention. Yandex Browser prevents certain widespread internet-based threats, but it is not a comprehensive antivirus program. However, Protect technology protects against computer threats that antivirus programs do not block. We recommend using both for full protection. This type of unwanted software adds an address to the system registry for an advertising site that imitates a popular online service. The address is added to the key where legal software is registered for auto-start. As a result, every time you restart your computer, your default browser opens the advertised site. This type of unwanted software comes in the form of a driver-filter. It intercepts internet traffic to display intrusive and shocking ads in the browser, open ad tabs, send users to unwanted sites, and steal their personal data. This type of software works regardless of what browser you're using and even when the browser is closed. This type of unwanted software changes your system DNS settings. Each time the user opens a web page, the browser sends a request with the specified domain to a special DNS server. This DNS server sends the corresponding IP address in the response. Unwanted software changes the IP address of the standard DNS server. As a result, all queries will be sent to a different server, which will redirect users to malicious, phishing, or advertising sites. The hosts system file located in the C:\Windows\System32\drivers\etc folder contains a list of website domain addresses and their corresponding IP addresses. Malicious programs can write fake addresses to the hosts file, block access to popular sites, redirect users to phishing pages, or disable browsers' security functions. This type of unwanted software installs malicious extensions that open advertising tabs in the browser, display intrusive or shocking ads, or steal user's personal data without the user's knowledge. Antivirus programs are not very good at recognizing malicious extensions. This is because all extensions operate within a browser and do not affect the computer’s operating system. We recommend installing extensions from the Opera Add-ons web store or the Chrome Web Store, where they are checked to ensure they are safe. This type of unwanted software launches every time an infected computer is turned on and tracks apps that the user launches. When the user opens one of the browsers, the malicious software embeds its code in the browser process in order to redirect the user to an advertising or phishing page, change their default search settings, and steal the user's personal data. This type of unwanted software changes the browser launch shortcut by adding additional parameters (usually a site address) or launches another app instead of the browser. As a result, the browser will open the ad page every time you launch it.